After the discovery and final recognition of the genetic function of DNA (Avery, MacLeod & McCarty, 1944; Hershey & Chase, 1952; Watson & Crick, 1953), it rapidly became clear that DNA itself does not serve as a direct template for protein synthesis. In addition, a number of early observations suggested that ribonucleic acid is closely connected to cellular protein synthesis (Caspersson et al., 1941; Brachet, 1941— 1942). 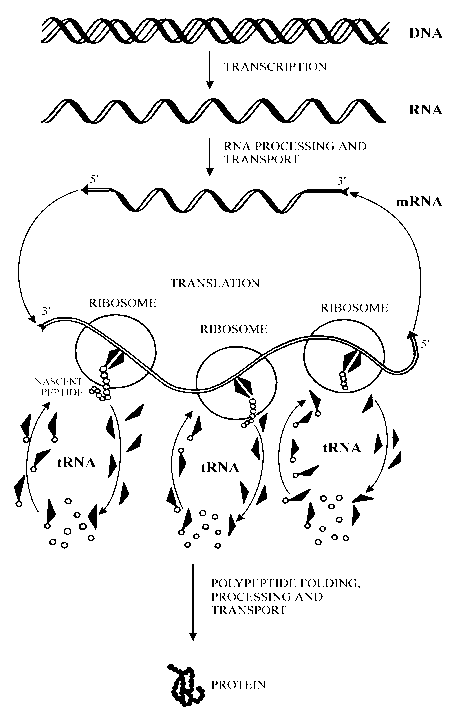 These ideas were developed and resulted in the concept that RNA is the intermediate responsible for the transfer of genetic information from DNA to proteins; in particular it has been suggested that RNA serves as a template upon which amino acid residues are polymerized (DNA ® RNA ® protein) (see Crick, 1959). This conceptual advance coincided with the discovery of protein-synthesizing ribonucleoprotein particles of the cell which were later called ribosomes (see Chapter 4). It had also been established that the RNA of these particles accounted for the main bulk of cellular RNA. Hence, it was naturally assumed that genes are transcribed into ribosomal RNA species, which in turn serve as templates for protein synthesis. This led to a "one gene - one ribosome - one protein" hypothesis. During 1956 to 1958, in order to test this hypothesis, a comparative analysis of DNA and RNA base composition in a large number of microorganisms was conducted (Belozersky & Spirin, 1958). DNA base compositions can be rather different in different groups of microorganisms, and it was hypothesized that if the above formulation of a "DNA®RNA®protein" model was correct, the base composition of total RNA would strongly correlate with the DNA base composition in bacteria. The experimental results, however, were unexpected. Despite great differences of DNA base composition in various bacterial species, the composition of total RNA was found to be similar in all of the studied bacteria, and did not mimic DNA base composition. These results implied that the bulk of cellular RNA, i.e. most likely ribosomal RNA, could not serve as a direct informational intermediate between DNA and proteins. At the same time, RNA base composition was shown to vary slightly for different bacterial species, and to be positively correlated with the base composition of DNA. The conclusion based on this correlation was that cells may contain a special minor RNA fraction which imitates DNA base composition and could possibly serve as an intermediate between genes and protein-synthesizing particles (Belozersky & Spirin, 1958). Earlier Volkin and Astrachan (1956) studied RNA synthesis in bacteria infected with DNA-containing T2 bacteriophage. Bacterial protein synthesis ceases soon after infection, and the entire cellular protein-synthesizing machinery is switched over to producing phage proteins. Most of the cellular RNA does not undergo any change during this process, but the cell begins to synthesize a small fraction of metabolically unstable short-lived RNA, the nucleotide composition of which is similar to the base composition of phage DNA. Several years later, in 1961, the minor RNA fraction, termed DNA-like RNA, was separated from the total cellular RNA. Its function as messenger, carrying information from the DNA to the ribosomes, was demonstrated in the direct experiments of Brenner, Jacob, and Meselson (1961), and those of Gros, Watson, and co-workers (1961); similar observations have been made by Spiegelman and associates (1961). It has been demonstrated that DNA-like RNA formed after the T4 phage infection binds to the preexisting host ribosomes (no new ribosomes are synthesized after phage infection), and the ribosomes associated with the phage-specific RNA synthesize the phage proteins. This RNA could be detached easily from the ribosomes in vitro without destroying the particles. It has been shown that this RNA is indeed complementary to one of the phage DNA chains. On the basis of their results on genetic regulation in bacteria, Jacob and Monod (1961) advanced the idea that a special short-lived RNA transfers information from genes to ribosomes and serves as a direct template for protein synthesis. The term messenger RNA was accepted in all subsequent studies. Who discoverd the Messenger RNA?